The year is 2071. When villains blow up a tanker truck on Highway One, a deadly virus is released, killing hundreds of innocent people. This is merely the beginning of a greater threat to human kind and, fearing a more devastating biochemical attack, a significant reward is offered for the successful capture and arrest of the evil culprits. 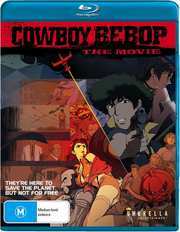 Bored with their current situation Spike and his rag-tag crew of bounty hunters aboard the Spaceship Bebop accept the challenge wholeheartedly – determined to track down the bad guys one way or another and cash in their reward. Ahead of them is an adventure like nothing they have ever imagined. A cult spin-off from the successful Anime TV series, brought to life by the famed Japanese Sunrise Animation Studios, Cowboy Bebop: The Movie is an electrifying full-tilt trip into a vast, colourful and dangerous galaxy.